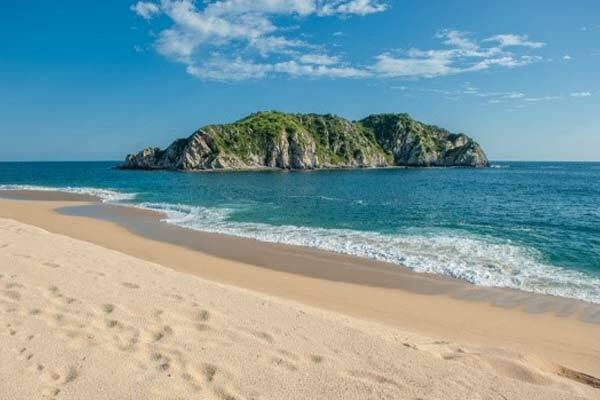 Snagging a world-class marlin, sinking a birdie putt on the 18th hole, or just walking on an untouched beach at sunset, Huatulco (pronounced “wa-tool-coh”) has become a popular resort destination. With many visitors shying away from the larger resorts, this hidden gem has been a hot topic among seasoned travelers in the region. With its nine pristine bays and 36 shimmering beaches in the southern state of Oaxaca (pronounced “wah-ha-kah”), this spot makes the perfect tropical getaway for Eco-tourists, bird watchers, hikers, and water sport enthusiasts. 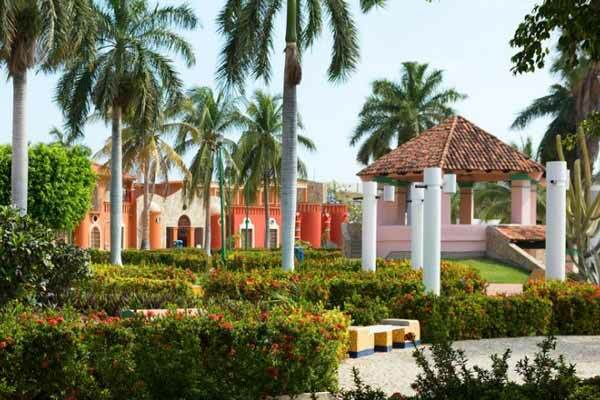 At the foot of the Sierra Madre del Sur mountain range, and nestled between the Copalita and Coyula rivers, this tourist-friendly haven has a sprinkle of a dozen posh hotels, along with untouched beaches, a manicured golf course, and a bustling marina. At the same time, it was developed in a way that prevented the environmental impact common in many resort areas. 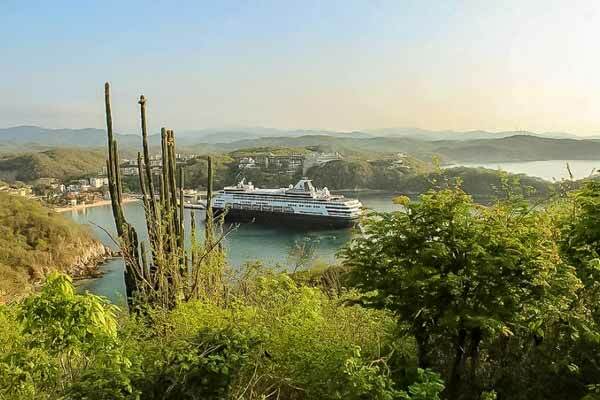 That meant capping the height of buildings to four stories and setting aside nearly 30,000 acres of land and sea to make Huatulco National Park, which protects the forests, beaches, mammals, and marine species. The days go by very slowly in this sleepy little beach-side resort. Developed by the Mexican tourist department, all the roads are nearly new, and the landscaping is quite impressive throughout the entire town. Beautiful trees, plants, and bushes are kept in perfect condition throughout the year. The public transportation is quite efficient, and the taxi service throughout the town and surrounding areas are very reasonable ($2 to $3). Take a walk along a flagstone path in the Parque Eco-Arqueologico de Bocana Copalita, located a few miles south of the city, along the Copalita river. The archaeological site, which dates back from 500 B.C., can truly amaze the history buff. You can explore on your own ($8 admission) or go on a three-hour group tour ($25) and learn much more with a bilingual guide. There is a modern museum that displays all the ancient artifacts. Artists in the remote mountain villages above Huatulco, create wool rugs, black pottery, and wooden creatures called alebrijes. Some have brought their talents and have set up looms and workshops in La Crucecita, Huatulco’s commercial center. Savvy visitors come here to buy the Oaxacan chocolate, coffee, mole and mezcal, and feast on tamales and tlayudas—crunchy tortillas topped with beans and cheese plus dried beef, shredded pork, or chicken. Situated on the main beach is Santa Cruz. If you have a hankering for a seaside lunch or a romantic dinner on the sand, set your compass to this little marina. This tucked away inlet has an array of boat tours that will take divers, snorkelers, or just visitors wanting to explore the many bays and beaches. A very popular day trip is to San Augustin Bay, at the Huatulco’s western end. Cruise for hours and enjoy the waves crashing on the seaside cliffs as you go up the coast. Especially watch for the dolphins, manta rays, and maybe some flying fish going airborne just beside your boat. San Augustin is a great place to stop to swim and eat, and is one of the few remaining seaside communities with restaurants, shops, and even a church up on top of the hill overlooking the whole bay, with its spectacular white sand beaches that seem to go for miles. Other tours take visitors to hill-top coffee plantations, white water rafting, and the jungle-like rivers. Do not miss the incredible waterfalls that are hidden in the secluded valleys, deep in the Sierra Madre mountains. Finally, don’t forget the main reason thousands of visitors worldwide flock to this historically cultural part of Mexico, better known as “El Sabor de Oaxaca”, you guessed it…. the traditional comida (pronounced koh-mee-da) or cuisine itself. The Oaxaca region is famous for its unique food. From the chocolaty “mole” sauce from the regional mountains close by, to the local mezcal (cousin of Tequila) stores, that offer free tasting until you find just your favorite flavor, and don’t forget to try the chapulines (fried grasshoppers—you must try them while you’re here). Don’t worry, for all you fish lovers, many restaurants in La Crucecita (the main town just up from the beach) serve lobster, shrimp, and the catch of the day and can be prepared just how you like it. Visitors that have been frequenting this little piece of heaven throughout the years, have taken their lifestyle to the next level, and try to make it a little more permanent. The lifestyle here is a fraction of what it takes to live anywhere in North America, and the expats and baby boomers are taking full advantage. A couple can find a wonderful two-bedroom condo for about $400 to $600 a month depending on your particular tastes. A nice home with an ocean view can set you back a little more at around the $800 to $1,200 a month. Most places have gardening and maid service, and gated properties are springing up at an alarming rate. On the grand scale, the area is quite safe, and because it is a federally built city, the security presence is quite prominent. The locals have a saying, “Nothing good happens past 10 o’clock at night.” Just friendly advice, but quite true anywhere you are traveling. The restaurants are very reasonable, where a $25 dinner for two with a drink is standard. A $5 Mexican dish is very easily obtained just about everywhere. I recommend Terra-Cotta restaurant for breakfast ($12 for two), El Grillo Marinero for lunch ($15 for two), and for sandy-toe ambiance, La Terraza Restaurante & Grille for a great dinner. Come visit Bahias Huatulco and see what all the fuss is about. The weather is great, the people are friendly, the crowds are somewhere else, and your money goes a long way. Chances are, you will find out why everyone is returning year after year to enjoy the calm waters and wonderful lifestyle. See you there, amigo.